Our 2018 Peru Wall Calendar makes a wonderful gift with images of Lake Titicaca where you’ll find the famous floating reed islands of Uros, Taquile and Amanti (Amantani) where the Aymara indian culture thrives. Hike to Condor Hill for a spectacular view overlooking the city of Puno with Lake Titicaca, the highest navigable lake in the world, extending out to Bolivia in the distance. 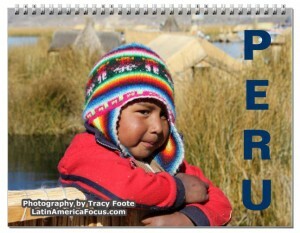 Visit Peru every month of the year by turning each calendar page to reveal a new scene. Some favorites are: November with the ruins of Silustani and December with the cover image of a young Peruvian boy. Photographer, Tracy Foote’s grew up on the west side in Manhattan, New York. Beginning age 8, she escaped the city to spend her summers hiking the Adirondack mountains in upstate NY where she grew a love for the outdoors. After traveling throughout South America, she uses her photography to help others find the perfect Peru gift for friends, family, tour guides, and more. Browsing the internet lead us to believe there would not be much in Puno. Travelers discuss being grateful for their hotel rooms since the city had little to offer. We were pleasantly surprised and actually wished we had time for an additional day in the area. Book early on Lan Peru. We made all reservations efficiently by internet and paid upon arrival. Great wonderful staff at the desk. No question was unreasonable. They assisted with directions to hiking to the condor and also a statue nearby with city views. Free internet downstairs, 2 computers – never had to wait. Wonderful breakfast of scrambled eggs with ham, a variety of juices, breads, tea, cheese. etc. We had triple room, flat screen TV in the room (if that matters to you), double sink bathroom, each with hot water in the sink, heater in the room – included in price, huge beds and great comforter with additional blankets. The print boarding passes for 1 sol per page. Cons: Unfortunately we were there on a Saturday night and we did experience a little noise despite being three floors up. We later found out there is a building on the plaza which is rented for parties. However, Sunday, all was quiet and we slept soundly. All in all, even if staying on a Saturday, I would again request a plaza view room with the tiny colonial like balcony and sunlight streaming in. Intiqa Hotel: We visited this and recommend it as an alternate choice. Rooms were spacious, actually “huge” and it had a modern feel. Nice area for internet use as well.